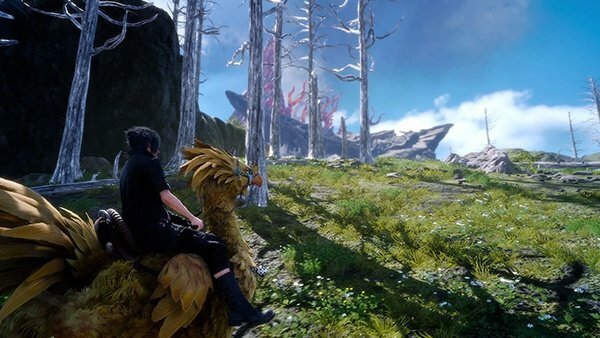 Chocobo is a Mount that players can ride in Final Fantasy XV. The Chocobo makes its expected return in Final Fantasy XV, after appearing in the franchise's past installments. They are fleet creatures that can use stamina for a dash boost. Though not as fast as cars, Chocobos can be fed Items that improve their performance and they can navigate terrain that cars cannot, making them ideal choices for shorter travel stretches that take you across varied terrain. Chocobos can swim, so players can ride them across bodies of water. Chocobos have different levels. The higher a Chocobo's level the more it can do, the faster it can go and the more stamina it will have. Much like traveling in the car, there are Abilities that reward Chocobo use, such as Chocojockey, Chocoracer and Chocobump. Chocobos are skittish around Enemies, so it's best to take them when you're not actively looking for Combat. If in combat, they will however provide assistance in the form of some useful combat tactics. Chocobo travel is locked at the start. To unlock them you will have to complete the Friends of a Feather Quest at the Wiz Chocobo Post. You will have to defeat the Behemoth named Deadeye. To acquire a Chocobo, visit a Chocobo rental station which can be found near lots and stores. As you approach them, they will be marked on your world map. Once rented, you can have them for 1-7 days at the cost of 50 gil per day. To call your mount to you, press the right trigger and then right or left on the D-pad. Navigate to the chocobo tab and call for it. You will then whistle for it and the Chocobo will apear by you. Approach it and then follow the prompts to mount and ride it. You can customize your birds at Chocobo posts by changing their name, color and medals. Seeds gathered throughout the game can be used as dyes to change their color. There are chocobo races in the game and succeeding in them earns you medals and experience. To win the race, you have to beat the time limit, be faster than your party members or complete other challenges. Beneficial effects can be bestowed upon chocobos by feeding them certain food when you camp at a haven.